A commenter on Dan Porter’s Shroud of Turin blog pointed out what I had previously realised, but had forgotten, that Dan’s "Tetradiplon" graphic illustrating how the Shroud of Turin, when "four-doubled" (Greek tetradiplon), with Jesus’ face uppermost, results in Jesus’ face only within a rectangle, in landscape aspect (exactly as in the oldest copies of the Image of Edessa), has a flaw in that it only shows three doublings of the Shroud (see above). Even Ian Wilson’s illustrations of this in his books (e.g. "The Evidence of the Shroud," 1986, p.113; "Holy Faces, Secret Places," 1991, p.142; "The Blood and the Shroud," 1998, p.153; "The Turin Shroud," 2000, p.111; and "The Shroud," 2010, p.141), show the Shroud doubled only three times. But some months ago I cut out a photo of the Shroud and proved to myself that the Shroud can be doubled four times in such a way that it results in Jesus’ face in a rectangular segment of the cloth, in landscape aspect,exactly as it is in early copies of the Image of Edessa. Here I will show how it can be done, in what is a reasonable way to fold a long cloth, minimising strain at its fold edges. This is consistent with major foldlines at one-eighth intervals, found on the Shroud by Dr John Jackson from raking light photographs of the Shroud taken in 1978 by the Shroud of Turin Research Project (STURP). Tetradiplon is just not a relevant issue as it only ,in one comparatively late text, referred to the cloth before it had been handed to Jesus. I am quite happy with it being used to describe a double folding four times as shown on the Parthenon frieze cloth! Why search any further when we have visual evidence of a cloth folded doubled four times. I don’t need to play around with alternatives. It is Wilson who needs to rewrite his text to make it quite clear that there is no reference to tetradiplon after Christ had wiped his face! I cannot work out whether he was just being careless or dot dot do dot. but if he does write another edition he needs to leave it out as it is simply not relevant to an already hopelessly weak argument. BTW when Stephen Jones wrote: “A COMMENTER ON DAN POTER’S Shroud of Turin BLOG (upper cases) pointed out what I had previously realised, but had forgotten, that Dan’s “Tetradiplon” graphic illustrating how the Shroud of Turin, when “four-doubled” (Greek tetradiplon), with Jesus’ face uppermost, results in Jesus’ face only within a rectangle, in landscape aspect (exactly as in the oldest copies of the Image of Edessa), has a flaw in that it only shows three doublings of the Shroud (see above).”, actually, he was not so much referring to Charles as to… me (copyright, please ;-)! Please carefully, re-read the posts on the issue. The true fact is Charles just took up my idea and made it its own. Okay, Max. Next time we are in the same city at the same time I’ll buy you a drink. Max- Well any intelligent reader would have spotted that Wilson got the illustration wrong but few would have gone back to the original text to find that he had got the placing of tetradiplon in the original text wrong too. And I think I have a first in showing that the sacred cloth of the Panathenaic festival was doubled over four times, the most obvious meaning of tetradiplon, so possibly implying that the cloth when given to Jesus as tetradiplon it had a sacred status. There is nothing in the text to suggest that that the cloth was anything but an image of a face and, as I have also pointed out, the grave cloths are mentioned later in the same text so the tetradiplon cloth cannot have anything to do with the Shroud. It is better for Wilson to cut out the whole issue to save himself further embarrassment. Charles, re your having ‘a first’ in showing that the sacred cloth of the Panathenaic festival was doubled over four times, I 100% agree. And what about my ‘first’ too re the Grek word tetradiplon to be reconsidered in terms of process and/or result ;-) for reconstruction’ sake? First for DeGruy Family history and now for my nightly blog based on my life & work…. I believe links w/ Merovingian Blood History ! Stephen Jones did a good job, in fact I always thought that any folding had to mimimise straining at the fold edges. 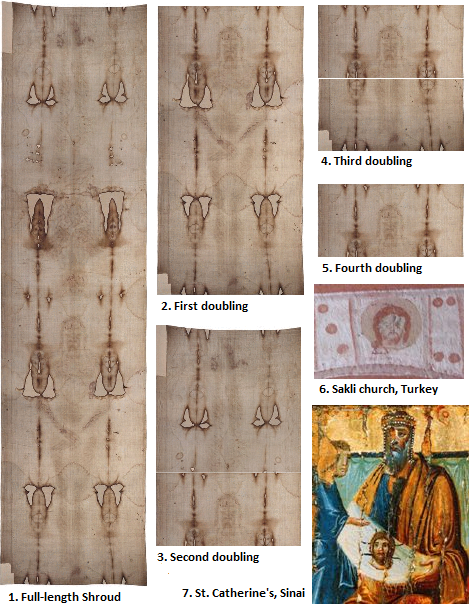 Diplon is usually translated as ‘folded in half’, but if it simply means ‘folded’, then there are several ways of folding the shroud four times to achieve the one-eighth size attributed to the mandylion/image of Edessa. Stephen Jones’s zig-zags put one in mind of Aldo Guerreschi’s watermark investigations, which might be relevant. But the basic point is ,Hugh, is that is not a shred of evidence that the cloth was folded in any way at all AFTER the image of the face had been placed on it. This is where Wilson misleads by giving the impression in his The Shroud that tetradiplon refers to the face cloth after Jesus had wiped his face on it. This is why he should take out this section altogether. If we are talking about possible foldings these should only refer to how the face cloth was folded before it was given to Jesus. And it is a face cloth as the grave cloths are mentioned separately in the same tExt. Now, overwhelmed ( actually underwhelmed) by Colin’s bright blue chemical mixtures, I must drop out to focus on the group of 22 that I am leading around the Greek Peloponnese for the next ten days. They are all convinced that the Greek economy will collapse leaving them stranded on a mountain hillside somewhere – getting them all to the airport will be challenge enough! The blue colour of my recent image-processing had nothing WHATSOEVER to do with the chemicals, needless say, that I used to develop the imprint on the linen as a YELLOW-BROWN negative image. The blue colour arises from the use of ImageJ to do a Secondo Pia style TONE_REVERSAL, which converts sepia to blue (everything is reversed – colour balance as well as image intensity). Had I so much as suspected that someone would mistake the blue of an ImageJ inversion and/or 3D rendering as a “chemical”, I would have converted my imprints to B/W monochrome first. There are different ways to fold the shroud in order to show only the face of Christ. Some were known in the Ancient world, as the technic of “Leporello” (as an accordion). Others are purely imaginative as the Stephen Jones proposal. The Leporello way doesn’t match the “tetradiplon theory” and Jones’ hypothesis has not any support in facts. The scheme of wrinkles that is added in this thread is incorrect and cannot be related with the first Century. Flury-Lemberg affirms that the main wrinkles –that is to say, those that refer to a way of folding-, are relatively recent and they are organised around a longitudinal wrinkle that folded the Shroud leaving the image in the interior. Sindonists’ scheme (Jones and Jackson) omits these facts in order to select only the appearances that justify their theory. Flury-Lemberg’s Sindone 2002 L’intervento conservative is quoted here from Andrea Nicolotti: “Una reliquia costantinopolitana dei panni sepolcrali di Gesù secondo la Cronaca del crociato Robert de Clari”, p. 174, note 82.